The Disney empire continues to spread even today. Talks of opening a Disney Resort in Shanghai have gone on for more than a decade. 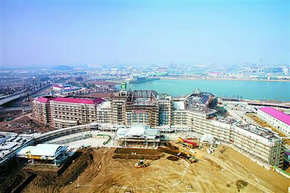 After rumours and negotiations, the construction work finally began right after the 2010 Shanghai Expo. Disney Parks unveils a first look at the new creative images, of both the reimagined attraction based on the world of Pirates, and the new hotels under development. The Shanghai Disney Resort will comprise Shanghai Disneyland, two hotels, a 46,000-square-meter retail, dining and entertainment venue, recreational facilities, a lake, associated parking and transport hubs. Shanghai Disneyland will look like any other Disney resort, complete with numerous themed lands based on Disney characters.